There are lots of myths around eye protection and tanning: What about the tan lines? Can’t I just shut my eyes instead? Here are the facts. First of all the eyelids do not tan. You do not need to worry about the possibility of having white eyes and a brown face. Even if you are worried about the the thin goggle straps leaving tan lines you can use Wink Ease stickers instead to protect your eyes. Secondly, eyelids do not provide sufficient protection from UV rays. The skin is too thin to be able to provide enough protection. UVA and UVB rays affect the eye differently. Too much UVB damages the cornea, while too much UVA damages the retina. UVB – Overexposure can cause swelling of the eye, redness, irritation and a feeling as though a handful of sand has been thrown in their eyes. UVA – Overexposure can cause problems with colour perception. Retinal burns caused by UVA overexposure can produce scarring in the rods and cones of the eye, which will reduce both visual acuity and sensitivity to colour. Unprotected exposure of the eyes to UV radiation can also lead to cataracts that cannot be removed by surgery. Ultimately it is your responsibility to wear eye protection during the tanning session. Make sure the eyewear, either goggles or stickers, fit properly and that no light leaks through anywhere. The elastic strap attached to the goggles is there to provide a tight fit, adjust it accordingly. 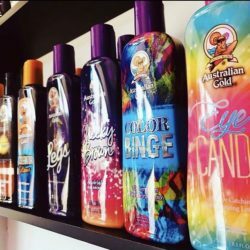 Remember we only get one set of eyes, do not let tanning, one of the best skin-care and overall health beneficial activities, damage them.